Washington, DC – Much has happened in the J20 (inauguration conspiracy) case since the NLG wrote about the first J20 trial in November 2017. Let’s start from the latest developments and work our way backwards: the second trial ended with either acquittals or mistrials on the charges for each of the defendants, a presiding judge threw out the conspiracy charge as a sanction for the prosecutor hiding evidence, the prosecutor dismissed all charges against two trial groups in an apparent attempt to avoid sanctions, and the prosecutor got caught hiding 69 recordings from the defense. This was all in the course of about three weeks—a period that came months after the prosecution entirely lost the first trial last year and subsequently dropped charges against more than 100 defendants. If your head is already spinning because of this list, that’s because an incredible amount of significant legal developments have been crammed into these cases. 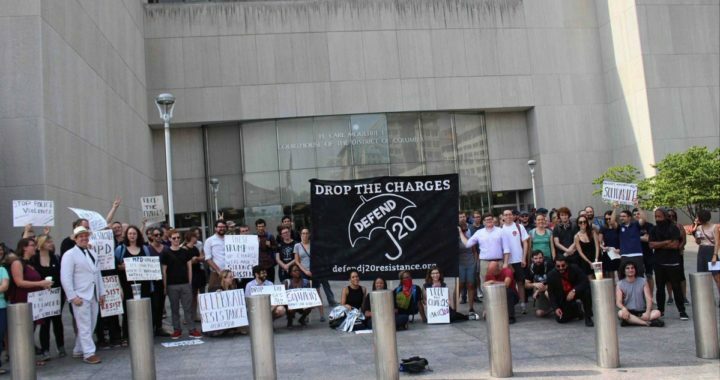 For in-depth information about the cases and ways to be in solidarity with the remaining defendants, follow Defend J20 Resistance and stay up-to-date on their blog. In this most recent trial (the M14, for May 14, group), four defendants went into the trial facing a slew of felony and misdemeanor charges adding up to more than 60 years in prison. While not all defendants faced the exact same charges, the misdemeanors included conspiracy to riot, engaging in a riot, assault on an officer, and resisting arrest; the felonies included inciting a riot and five counts of property destruction. The prosecution went hard against these defendants, particularly since they were alleging that three of the four of them had broken windows. Despite these efforts, the jury fully acquitted one defendant, acquitted on all charges for one defendant except for being deadlocked on misdemeanor engaging in a riot, acquitted one defendant of the assault on an officer charge and deadlocked on the rest, and deadlocked on all charges for the remaining defendant. The judge declared mistrials on all the deadlocked charges, so the prosecution has until July 11th to decide if they want to re-file the charges. Or they could cut their losses after their second defeat at trial and drop these politically motivated charges. Let’s look at how all this came about. As with the first trial last year (the N15, for November 15, group), the prosecution was relying heavily on the conspiracy count, Pinkerton liability, and the aiding and abetting elements of the property destruction counts to argue to the jury that all the defendants were guilty of everything. The prosecution was further relying on the idea that defendants staying with the anticapitalist/antifascist march after windows started getting broken, and then getting mass arrested by the DC police, proved that all the defendants incited the so-called riot. The N15 trial ended in full acquittals for each of the six defendants. In other words, the jury did not buy the government’s theory that attendance at a protest means that people are engaged in a conspiracy or are legally culpable for any criminalized acts that allegedly occur at that protest. This was a great victory for those defendants and their co-defendants with trials scheduled throughout 2018, as well as a strong blow to the prosecution’s draconian case. Yet many questions (and great risk) remained for the defendants still facing charges as 2018 began. Would future juries think the same? If so, would they apply that logic to people the state was alleging broke windows? More than 200 people had been arrested on inauguration day and ultimately slapped with blanket charges, facing more than 60 years in prison. In January, the prosecutor suddenly dismissed without prejudice charges against 129 of the remaining 188 defendants, leaving 59 facing the full brunt of the state’s repressive attack and the full weight of the uncertainties of going to trial. The M14 trial group became the first trial of 2018 after another series of strange legal wranglings caused the March and April trial groups to be rescheduled. Both this trial and the N15 trial relied heavily on a video of a Disrupt J20 planning meeting prior to the inauguration—a video surreptitiously recorded by one of the several Project Veritas operatives who had infiltrated multiple protest planning meetings. Project Veritas is a far-right “investigative” organization that has become infamous for its unscrupulous attempts at conducting sting operations against groups and individuals they disagree with. The prosecution also stressed, at different times and to various extents, that they had handed over to the defense the entirety of this video and that it was the only one obtained from Project Veritas. While the M14 trial was happening—and after the jury in that trial had watched this video—pre-trial motions filed by defendants in upcoming trials led to the prosecution admitting that they had edited out a portion of the video that included the operative saying that the protest planners didn’t know about the “upper echelon” stuff, with the clear implication that this person was talking about illegal activities. But that’s not all: they eventually had to admit that they only recently provided the defense with an additional 69 (yes, nearly 70!) Project Veritas recordings (66 videos and three audio recordings). They also could not provide the judge with a reason for why they had not included these videos with the mountain of discovery that had been shared with the defense over more than a year of pre-trial proceedings. Needless to say, the court did not look kindly on the prosecution hiding evidence from the defense and misleading the court. As the extent of the prosecution’s malfeasance was becoming clear, they suddenly filed to dismiss without prejudice charges against all the defendants in the June 4th trial—some of whom were alleged planners of the protest, and thus of the alleged conspiracy. They also dropped the felony charges against the May 29th trial block, leaving them facing a few misdemeanors each; these misdemeanors were dropped over the weekend prior to their trial date as well. These sudden dismissals without prejudice showed the extent to which the state’s case was crumbling. Yet this went even further when the judge dismissed with prejudice the conspiracy charges and ruled that the prosecution would no longer be able to rely on Pinkerton liability in its prosecution. The judge said that this sanction applied to all the defendants, but the dockets of the remaining defendants have not yet reflected this through dropped conspiracy charges. Some defendants have filed motions to have the sanctions applied to them as well. Pre-trial hearings start up again later this month, so there will likely be many more significant developments in the near future. All these revelations and sanctions were happening on the third floor of the courthouse while the M14 trial kept going on the second floor. The jury even went into deliberations with the known Project Veritas video in evidence—even though they were the only ones at that point who did not know that this video was the keystone in the prosecution’s evidence-hiding scandal. An obvious question that arose was whether those four defendants were getting a fair trial with that video still in evidence. Sensibly, the defense petitioned for mistrials. But the judge held off on ruling on whether there were mistrials or not until after the jury came back with its verdicts. Even the process of learning the verdicts was bizarre in the M14 trial. The jury notified the judge several times that they were deadlocked on the charges and not likely to reach consensus. Interspersed with these jury notes was one juror telling the judge she had seen a sticker in a bathroom in the courthouse that said “google jury nullification.” She reported that she then did exactly that, and then went on to discuss it with the other jurors. Later, another juror told the judge that he had seen on his Twitter feed commentary about the trial that reinforced his doubts about the prosecution’s credibility and competence, although he remained able to be impartial as a juror. After each note, the judge told the jury to keep deliberating. So the jury kept deliberating, and kept deliberating. They came back fairly quickly with full acquittals for one of the defendants, who was basically just alleged to have been present that day. This victory was encouraging and a relief for defendants and supporters alike, but left the remaining three defendants hanging. Over the next few days, the jury came back to say they were acquitting one defendant of all charges except for a misdemeanor they were deadlocked on. Mistrial on the deadlocked charge. The next morning, the jury came back with an acquittal on one charge for one of the three remaining defendants, and the note that they were deadlocked on the remaining charges for that defendant. The judge quickly declared a mistrial on the deadlocked charges. The next morning, the jury came back to say they were acquitting one defendant of all charges except for a misdemeanor they were deadlocked on. Mistrial on all the deadlocked charges. Several hours later, the jury said they were also deadlocked on all the charges for the final defendant. Mistrial on all charges! These mixed victories for the defendants are more strong blows against the prosecution, but the fight is far from over. The prosecution has until July 11th to refile charges. In the meantime, the next trial group is scheduled to go to trial on June 25th. More trials are scheduled for July through October, so this saga is ongoing. The June 25th trial will be the first one to include testimony from the FBI agent who the prosecution was finally able to get admitted as an expert witness about the black bloc tactic—after a vague attempt to introduce an expert witness last year and a failed attempt to get a witness who would only testify under a pseudonym earlier this year. Now is the time to gear up for the next round of support and solidarity for the J20 defendants, such as participating in the day of solidarity called for on June 25th! ← Exciting News About #Law4thePeople 2018!